Vice-Rectors Dmitry Tayursky and Andrey Kiyasov are taking part in an official visit to Japan. 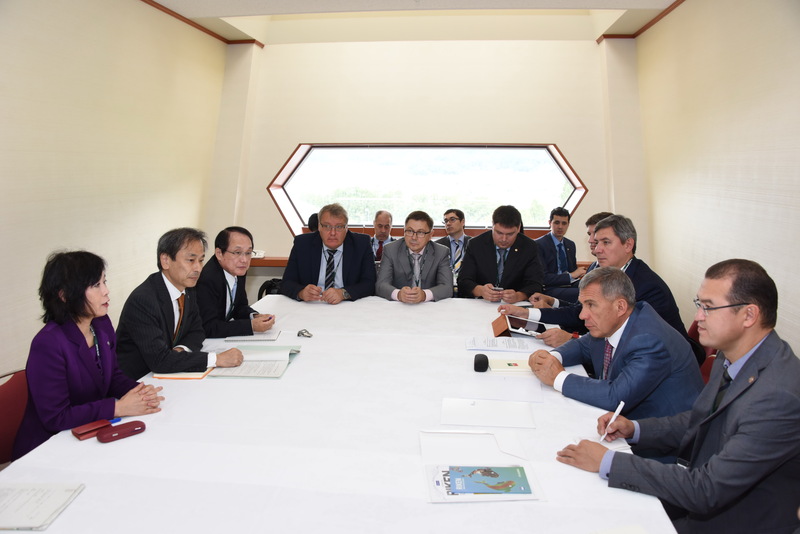 The wider delegation includes President Rustam Minnikhanov and other Tatarstani officials who are attending the STS Forum in Kyoto and holding meetings. KFU representatives joined three such meetings. The first was with Shoichiro Itakura, Executive Director of the Institute of Physical and Chemical Research of RIKEN; President Minnikhanov was also present. The Institute has been KFU’s strategic partner since 2008. As a result of the meeting, KFU and RIKEN will organize a visit by a Tatarstan’s delegation to Kobe, where RIKEN’s K Computer is situated, during STS 2018. The President ordered to provide full support to KFU-RIKEN projects. In particular, they were encouraged to further develop research in genetic predisposition to tumors. One of the municipal districts in Tatarstan may serve as a test ground for the project. Another meeting was with Japan Science and Technology Agency, and the third – with Mitsubishi Research Institute. In Kyoto the KFU delegates partook in a forum of university presidents. KFU was the only Russian university among the 50 attending institutions. Our employees engaged in panel discussions on life sciences, Earth and space research, nanotech and IT, AI, genomics, and other areas. Today a visit to Kanazawa University began. During a meeting with President Koetsu Yamazaki the sides agreed to open partner offices on each other’s premises. Two delegations from Kanazawa plan to arrive in December – the first will comprise engineering, physics, and mathematics experts, and the second – medical researchers and linguists. As Dr. Tayursky told us, the Kanazawa – KFU – RIKEN trio won a grant program called “Educating Leaders of the Future”. Every year 100 students from Kanazawa will come to KFU, and 70 students – from Kazan to Kanazawa. The programs will be in the English language. The visit will conclude at RIKEN’s offices in Yokohama.